Cecile de France is a girl at ease. Always smiling. Always fresh. Always pretending to be the girl from next door, not the star. Here in France she is a big one, though. And that’s probably what the French like: elle ne se prend pas la tête, she’s not making a big deal of her success. When she arrived from her native Belgium at the Gare du Nord in Paris, she was just 17. She had no connections, no relations, no money. Just a lot of confidence and even more talent. Now, at the age of 35, Cecile de France has gleaned all the prizes French cinema has to offer: she won the Romy Schneider award, the Louis Lumière award and two César awards for Most Promising Actress in L’Auberge espagnole (2002) and one for Best Supporting Actress in Les Poupées Russes (2005). You might not necessarily know Cécile, but this is probably about to change: She is starring in Clint Eastwood’s latest film which opens in French cinemas today. In “Hereafter” Cécile de France plays a French journalist named Marie who has had a near death experience when carried off by a tsunami. 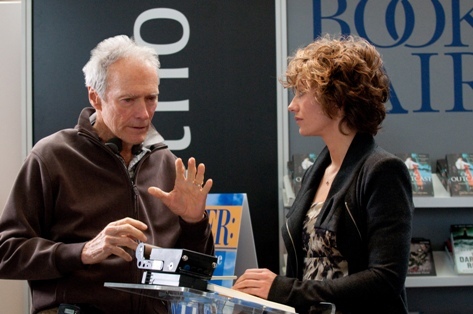 Cécile really enjoyed the way Eastwood shoots. He only does one take. “It’s like a shot of adrenaline, it’s thrilling”, Cécile admits. It actually fits her, because Cécile is a girl from the theatre. On stage, like in real life, you never have a second take.